There is nothing like a real fire to add a warm, inviting feel to your home. However, an open fire can be an extremely inefficient way to heat a room. Much of the heat will go straight up the chimney and an open fire can create additional draughts. In recent times, stoves, including traditional wood burners have become increasingly popular options for heating the home. Not only is a stove energy efficient, but it enhances the living space by creating a focal point that draws people together in a warm and cosy environment. Wood is a major source of renewable heat energy and if burned efficiently, it produces virtually no smoke. As trees grow they absorb carbon dioxide (Co2), incorporating the carbon into new growth and returning oxygen to the atmosphere. When the wood is burned this carbon is oxidised and released as Co2. As a result, using wood from sustainably managed trees reduces net Co2 production (small amounts are released by the activities of processing and transportation) compared to using fossil fuels. This means that heating using wood can significantly reduce our reliance on fossil fuels while also reducing our Co2 emissions. Many large towns and cities in the UK are smoke control areas which means that any stove you install will be required by law to be DEFRA approved if you wish to burn wood. 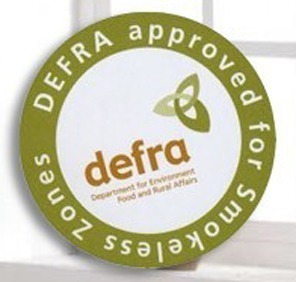 DEFRA is the official Government Department which regulates smoke emissions under the Clean Air Act. DEFRA stoves come in a wide range of styles to suit all tastes and budgets and are supplied by leading manufacturers such as Esse, Stovax, Purevision & Jotul to name a few. DEFRA exempt stoves are modern appliances that are very different to older stoves or open fires. They are airtight for precisely controlled airflow and usually feature airflow systems that provide secondary burning of gas and smoke particles before these can go up the chimney. The result is not only a cleaner burn with clearer, barely visible smoke, but also much higher heating efficiency – requiring far less logs to heat the room. All DEFRA exempt stoves are independently verified by HETAS to ensure they meet these strict requirements.